11 « July « 2012 « Nothing in Biology Makes Sense! Evolution this year was fantastic! So many wonderful talks and posters, THOUSANDS of evolutionary biologists and Ottawa was the perfect venue (in my opinion). To wrap up these four days, I’ve listed below some of my personal highlights (and a few lowlights). ** This video introducing how parasites can affect host behavior, which David Hughes used to introduce the ESEB Symposium (“Influential symbionts: Master manipulators of adaptive host behavior”), was very memorable. The first speaker, Sven Pettersson, had an entertaining anecdote about how babies are parasites and they scream at birth because they’re go from a cozy, warm place to being squeezed through a tube out into a cold foreign place, after which the food tube to their host and only world they’ve ever known is disconnected. This, he said, is our first introduction to anxiety and our microbes may begin to influence us that exact moment. ** The SWEEET symposium featured women with PhDs that now work outside Academia. The talks I attended didn’t apply strictly to women (in a good way) and I found it kind of soothing to hear Lalita Acharya talk about her career with NSERC and Jennifer Carpenter‘s journey to journalism and teaching, because that’s what they wanted to do. The question/answer portion of the symposium held no awkward pauses, as many people had excellent questions. The panelists never regretted getting a PhD before heading out into “the real world” and all believed it had been a major asset in their chosen careers. ** The Jasper Loftus-Hills Young Investigator Awards (sponsored by ASN) was terrific! Rowan Barrett talked about massive field experiments in Sticklebacks and mice; Jen Perry talked about sexual conflict in three (yes, three) insect systems and Liam Revell talked about his latest conquests in R and phytools. ** Lunch was provided the first three days and I thought that was really convenient. It allowed lunch to be a time of chitchat and meetings instead of rushing about trying to make it back to the conference center in time. I hope this continues in the future (even though obtaining pretty good food close to the OCC was relatively easy). ** Peerage of Science intrigues me and anyone who didn’t stop by their booth should consider checking out the webpage (or our previous post on the topic here). Turning peer review into something we choose to do (and get recognized for doing well) instead of something we have to do (and all time spent goes away into anonymity) sounds like a good direction to be heading. ** I am now inclined to join Twitter – the tweets were entertaining and surprisingly useful! ** The Ottawa sound and light show! 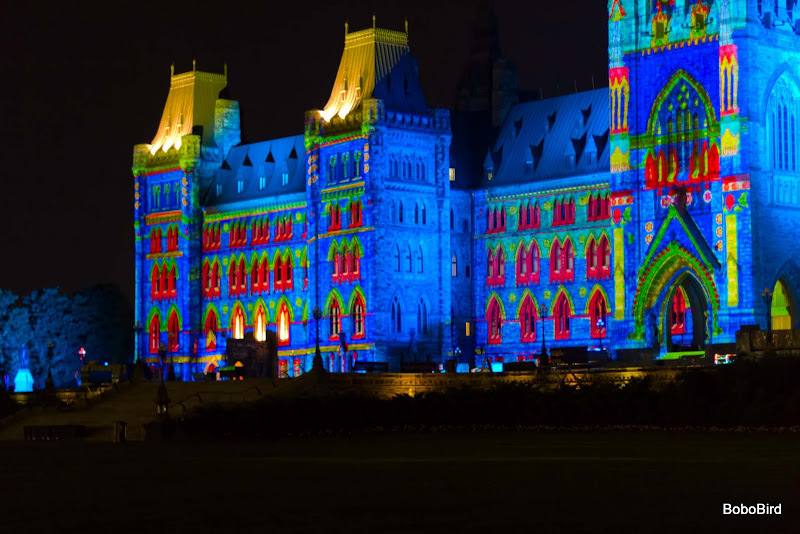 This was an absolutely amazing presentation on the history of Canada, projected onto Parliament. I’ve never seen anything like it! ** The cost of alcohol, am I right? ** I understand the environmental reasons for no swag, but maybe having a pre-set (or pre-ordered?) number of coffee mugs would have been successful way to balance wastefulness and useful awesomeness (i.e., “I wanted a coffee mug”). Anyone else have highlights to share? Can’t wait until next year, y’all! 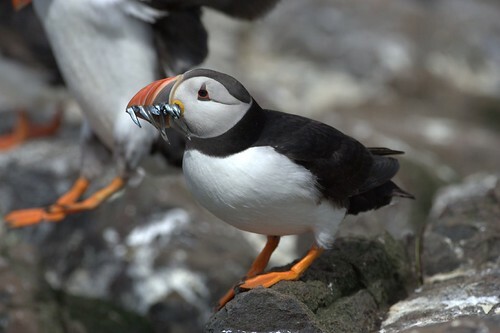 Kirsten Bowser is running puffin faeces through next-generation sequencing to identify what the adorable seabirds eat—and she’s already found some prey species that wouldn’t be easily identified just by watching what puffins bring back to their nests. Brian Counterman showed that hybridization between subspecies of the South American butterlfy Heliconius erato with different wing patterns can transfer wing patterning between subspecies—mostly by transferring a single chunk of DNA that doesn’t code for any protein, but performs a regulatory function. What’s more, the same region is being moved between multiple pairs of hybridizing H. erato subspecies.